For over a year, I have been asking for an affordable tool to give me deeper knowledge of owned Facebook audiences, and today I got just that: Facebook’s Audience Insights, a free tool available in the Ads Manager. If you don’t have access to it, hang tight or reach out to your Facebook representative. My initial thoughts: wow, it’s fast. Like, zero load time when you click around. It’s nice to set broad-stroke filters and see the data change instantly. Unfortunately, Lookalike and WCA audiences are not supported, but you can analyze all of your custom audiences and Page fans to develop better messaging to these groups. This tool makes it easy to create new “audiences,” save them, open them up later, duplicate them, and eventually create ads from them. You can also compare audiences against all active Facebook users within your target country. To start, I created an audience of Page fans for an e-commerce client that sells to women only. After de-selecting “Men” in the filters on the left, which excludes men from all charts and tables, I noticed how the charts and graphs changed, implying a significant number of men have liked my client’s Facebook page. Immediately this reveals one of the cool ways to use the tool: challenge what you think you know and what you expect to see. The most obvious opportunity above is Clothing, where my audience has 29% more affinity than general Facebook users, and where 90% of my total audience can be reached. Another good opportunity is Health and Beauty, with 67% more affinity than Facebook users and 50% of my total audience. 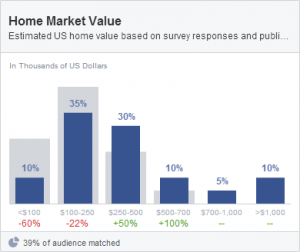 A look at Home Market Value reveals how affluent my fans are relative to the general Facebook population. From this I can test other insights into luxury purchase behavior and expensive tastes. While I might already have known my customers were more affluent, what I didn’t know was how they stack up to Facebook users in general. As I mentioned earlier, this tool is a good way to challenge what you think you know. For an educational subscription client, I was surprised to learn my customers skew low for online spending and high for offline spending. I would have thought otherwise. In any case, now I can start to think about what offline stores they frequent and find new ways to target them. Another interesting test is to create an audience of Fans and an audience of Customers, then go back and forth to see how they differ. For a travel client, I was surprised to see how many more customers than fans actually spend money on travel. Some folks will use this tool to develop targeting for new ads, but for that purpose I don’t see much benefit over the latest and greatest Power Editor. I would really like to see deeper insights, especially in the area of Interest targeting. My initial hope was to load up a customers list and see 25 new ideas for Interests. Instead, I see just 2 or 3. I was also hoping to load up a Lookalike audience, but it looks like we’ll have to wait. The same goes for WCA audiences. How slick would it be to install your WCA code on your website, wait a couple weeks for the size to build up, then analyze your web traffic in Facebook’s terms? I could package that service and sell it. Hopefully, one day I’ll be able to!